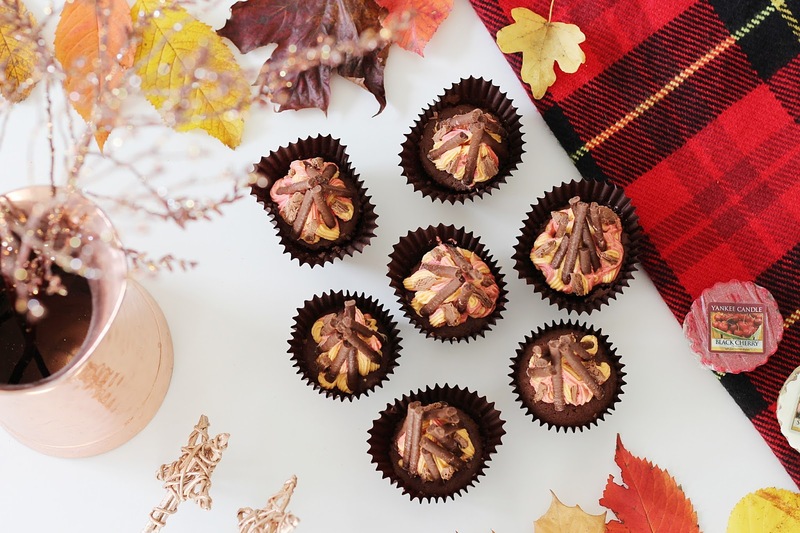 At this time of year I love rummaging in my baking cupboard and whipping up some yummy autumnal treats - nothing beats getting in from a chilly walk and grabbing a mug of hot chocolate with a delicious cake or some spicy gingerbread. Ever since I first got into baking, I've made it a bit of a tradition to bake something delicious on Bonfire Night. 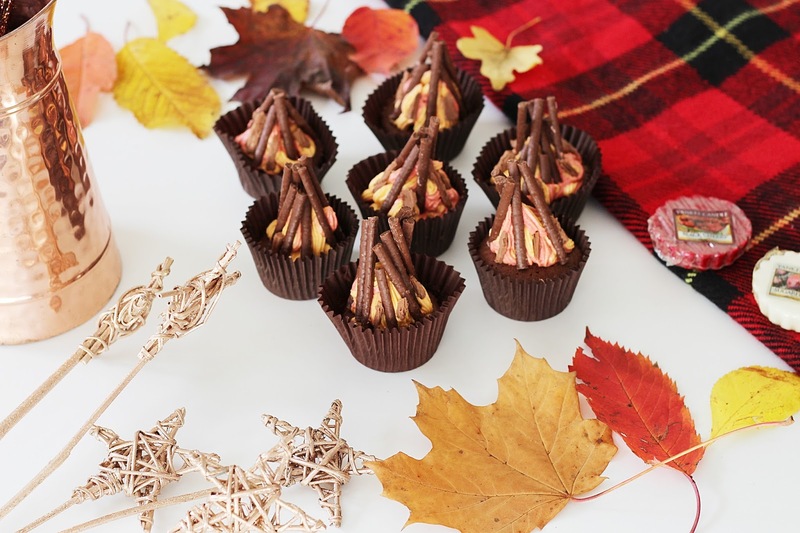 Whether it's star-shaped biscuits, tasty s'mores or traditional toffee apples, I like getting busy in the kitchen and creating something yummy for one of my favourite nights of the year. The method I follow was pretty simple - basically mix all the ingredients for the cupcakes together (start with the butter and caster sugar, then add in the eggs, fold in the flour and cocoa powder and finish with the orange flavouring) and pop a spoonful into each cupcake case. Then stick it in the oven for 15-20 minutes on 180 degrees. For the buttercream, I mixed the butter and icing sugar together until they were the right consistency and then separated them into two bowls - one of which I added orange food colouring too, and the other red. Then I put the orange buttercream on one side of a piping bag with a star nozzle, and the red on the other side (this can be a bit messy but it's worth it for the effect you get!). 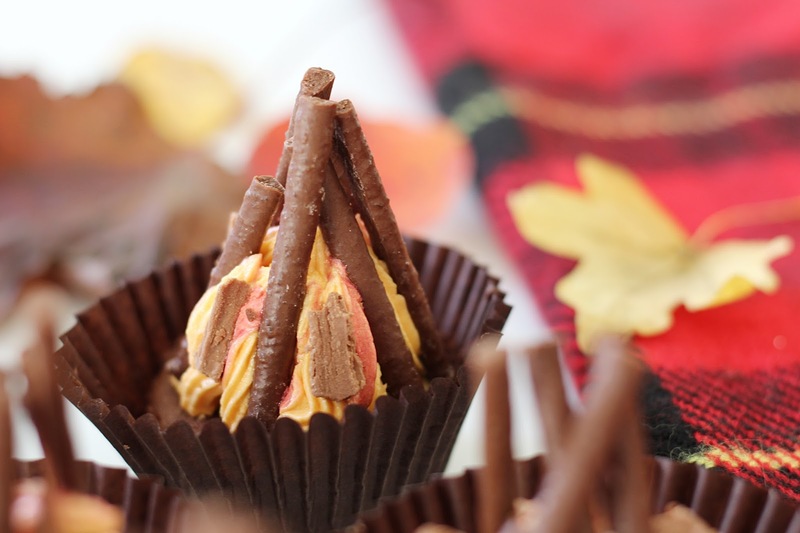 Then you literally just pipe flames onto the cupcake, layering them up to add structure, and finish them off with orange Matchmakers and crumbled-up Cadbury Flake. I felt like mine looked a bit sad until I add the Matchmakers and the Flake, so definitely make sure you do this step! 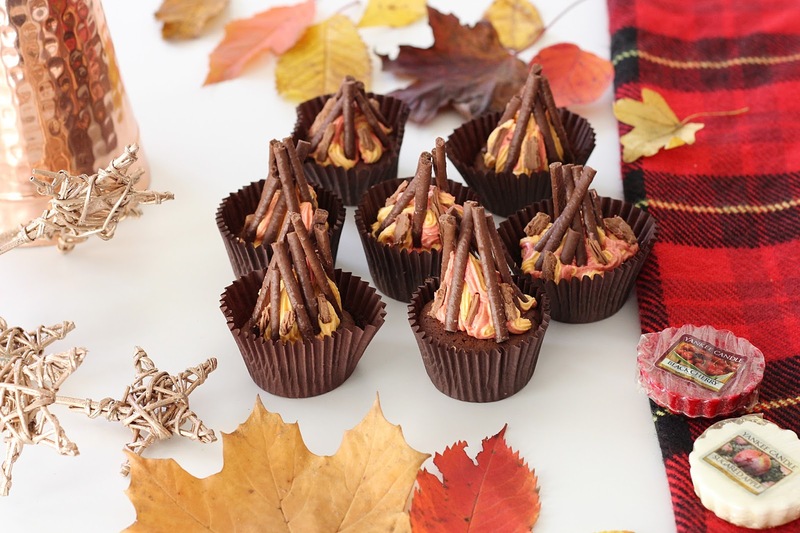 I'm actually really impressed with how these turned out - the effect of the red and the orange looks great and although I've never used orange flavouring before it really makes them that little bit more delicious! 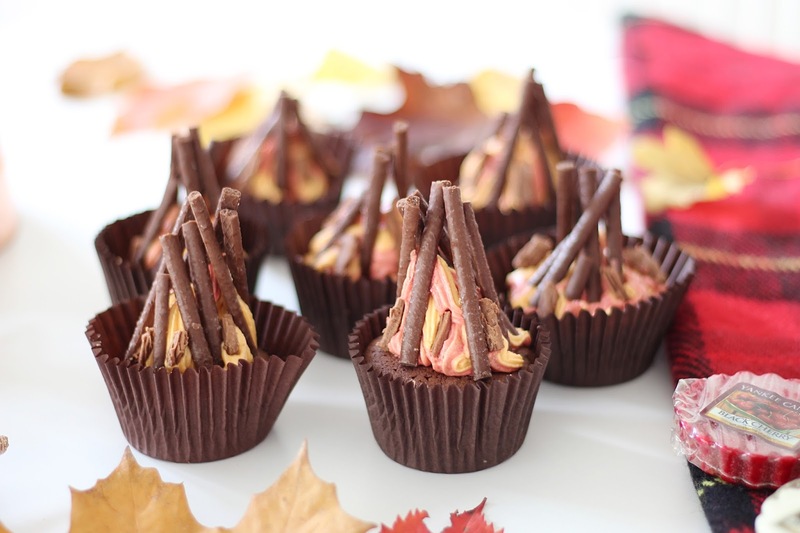 I think these would be perfect for Bonfire Night parties or just in general throughout the autumn months. 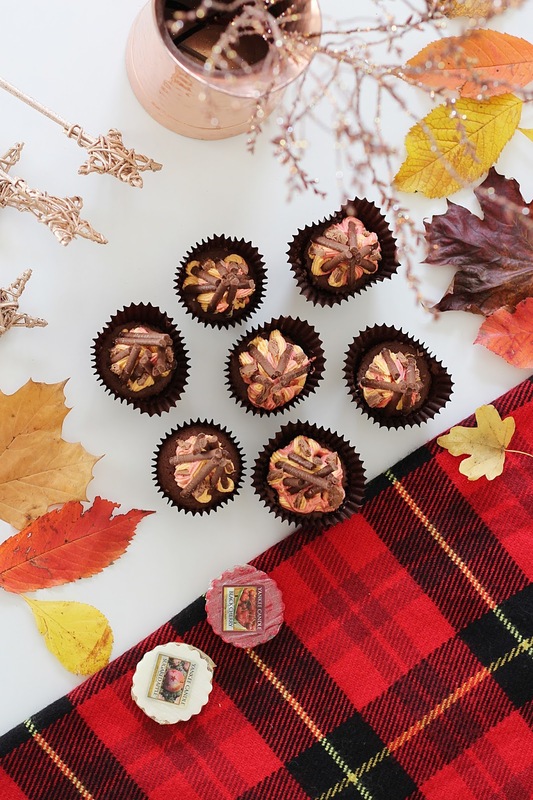 Do you enjoy baking at this time of year too? Let me know if there are any particular things you'd like me to have a go at baking!